Kathleen Frericks, M.Ed. (Montessori Education), Xavier University; BS (Business Administration), Xavier University. 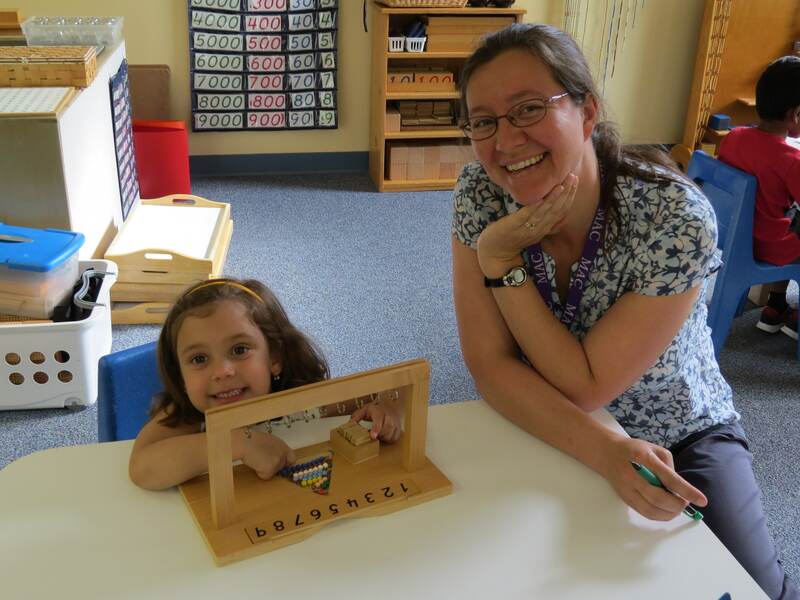 Kathleen holds an American Montessori Society (3-6) Certification. This is Kathleen’s nineteenth year with us; she is the Kindergarten teacher in the morning and works with the youngest group in the afternoon. Two of her children graduated from The Child’s Place. Mina Patel, AMS (3-6) Certification, Greater Cincinnati Center for Montessori Education. She has a BBA (Accounting and Marketing), University of Texas. This is Mina’s tenth year teaching at MAC. She will be responsible for the Kindergarten group in the afternoon class. She was also a MAC parent for eight years. Kathleen Kehling, Montessori Teaching Certification (3-6), Greater Cincinnati Center for Montessori Education; she also attended University of Cincinnati. This is Kathleen’s eighteenth year with us; she had several years’ experience in preschool programs prior to joining us. She is responsible for the middle group. She also has a child who graduated from MAC. Laura Shary, Montessori Teaching Certification (3-6), Greater Cincinnati Center for Montessori Education. Child Development Associate Certification. This is Laura’s thirteenth year at MAC. For six years prior to joining MAC, Laura was the Infant/Toddler Director of The Children’s Center in Blue Ash (owned by the Elder family). Laura is responsible for the youngest group in the morning class. Souad Karaman, Montessori Teaching Certification (3-6), Greater Cincinnati Center for Montessori Ed; BFA, New York Institute of Technology. This is Souad’s seventeenth year with us as a Montessori Teacher. Prior to that, she worked in our Extended Care Program for a year and was also our Elementary Art Teacher for a year. She is the Kindergarten teacher and mother of a child who graduated from The Child’s Place. Ellen Koenig, B.S. (Montessori Education), Xavier University. Ellen holds an American Montessori Society (3-6) Certification, Ohio Certification PreK-3, and Orton-Gillingham initial level certification. She also has taken graduate courses at XU at the 6-9 level. Ellen taught at MAC for 11 years before leaving after the 2009-2010 school year to be a stay-at-home Mom. She returned to our staff in the fall of 2012. She is responsible for the middle group and has a child at MAC. Amy Hruschak, M. Ed. (Montessori), Xavier University, American Montessori Society (3-6) Certification, and BA (Journalism), Kent State University. Amy came to us with experience teaching at Montessori schools in the area. This is her fifth year on our staff, and she is responsible for the youngest group in the morning class. Her two children are enrolled at MAC. Brandy Sovak, BS (Early Childhood Education), University of Cincinnati. Brandy holds a K-12 reading endorsement. She had worked with preschool/kindergarten students for four years and as a fifth-grade teacher for one year before coming to MAC. This is her twelfth year teaching with us. Joni Carlson, Child Development Associate (Early Childhood Education). This is Joni’s tenth year working at MAC. She joined MAC with 15 years combined experience working with young children at The Children’s Center and The Child’s Place (owned by the Elder family). She taught in both the Constructivist and Montessori Programs.